This fall our family was given a butternut squash. Unlike some vegetables, such as the eggplant I was given this summer, I have some experience with this squash and have previously prepared it by roasting it in the oven with a little butter. Although I enjoy squash prepared this way, I wanted to try something different and hit the internet for new ideas. I stumbled upon a number of different websites with soup recipes and ended up combining three of these recipes to appeal to the tastes of my family and my short attention span as it relates to cooking. 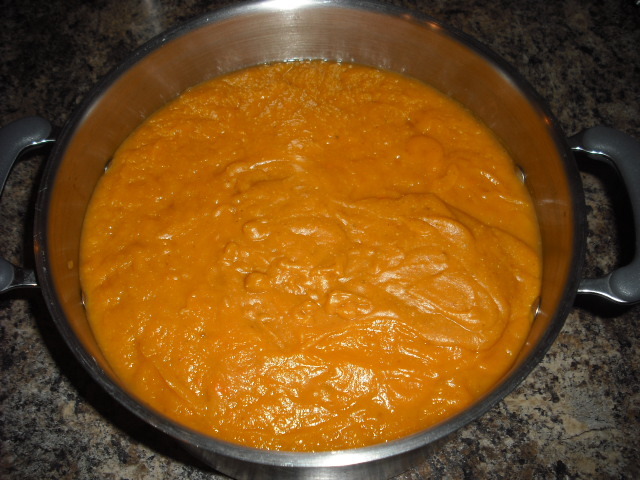 The end result is a fairly healthy and low calorie dish that my whole family enjoyed! Finished product. Although it looks like baby food, it’s delicious! Drizzle olive oil over two baking pans. Cut both squash in half, lengthwise, scoop out seeds and place face up on pan. 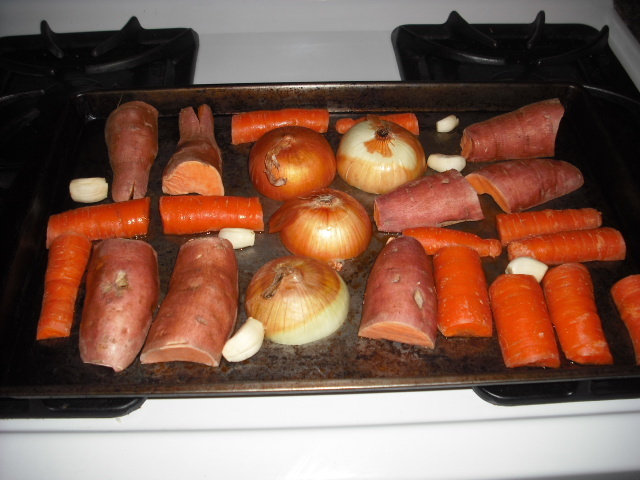 Cut the carrots, sweet potatoes and onions in half (leaving the skins on the onions) and place face down on the pan. Place the garlic on the pans, drizzle olive oil over the top of everything. Put the pans in the oven and roast for approximately 30 to 45 minutes. While the vegetables are roasting, peel and core both apples, cut into slices and place in slow cooker. Pull the pans out from oven when you can pierce the squash easily with a fork. Scoop out the squash’s flesh and throw into the slow cooker along with the garlic, onions, carrots and sweet potatoes. 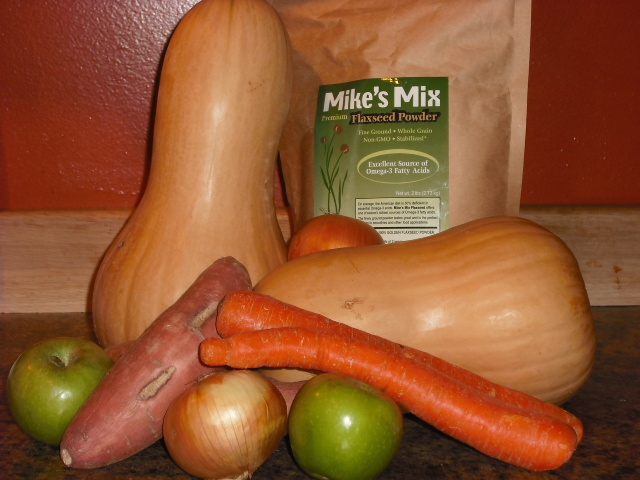 Add Mike’s Mix Flax Seed and coriander. You can modify this recipe to make it vegan by substituting water in place of the chicken broth. This specific recipe was used for my family’s Thanksgiving dinner. As is, it serves approximately 8-10 people but it can easily be cut in half for a smaller serving.